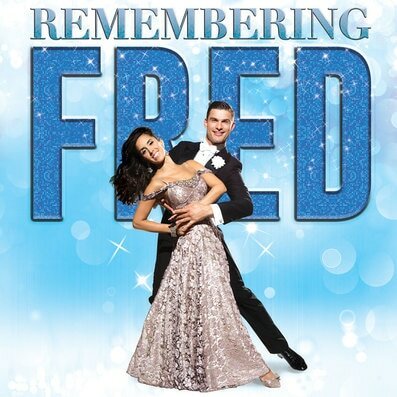 Remembering Fred, starring Strictly Come Dancing couple, Aljaz Skorjanec and Janette Manrara, is styled as if it were a radio broadcast. As the lights on the Cliffs Pavilion stage dim, our host of the evening, David Page, bounces on to the stage and an air of anticipation is created, with a count-down to the radio show going 'live'. Michael Ball's voice is heard through the blackness (is it me, or is he in or on everything these days?) and he introduces us to Fred Astaire ‘fans’, such as Darcey Bussell, Ava Astaire, Ginger Rogers, Gene Kelly, Irving Berlin, Twiggy, Don Black and Bruce Oldfield, amongst others, who talk about how the screen icon touched their lives and what made him so special throughout his 60 year career. Featuring a live band on stage, the show kicks off with the iconic Top Hat and it's not long before Aljaz and Janette suddenly appear as if by magic on the staircase balcony to show off those wonderful dance moves, which despite having seen numerous times on Strictly Come Dancing on the tv, cannot be beaten by being seen with your own eyes. Having been lucky enough to get front row seats for the Southend show, we were really able to appreciate the hard work that goes into these routines; yet Aljaz and Janette perform every fluid move they make with such ease and grace they make it look easy. The flirty Aljaz even has time to give us lucky gals in the front row a little wink as he whizzes Janette past our eyes! This man is seriously good looking and Janette is endearingly beautiful, with so much energy in such a tiny frame which completely belies her strength. Together, you really can appreciate how they have become two of the world's greatest dancers; they have such sophistication, poise and passion in their routines. ​The way Aljaz looks at Janette while they are dancing just melts your heart and it's no surprise to learn, later in the show, that the couple will be getting married this summer. In a section of the show where the pair are interviewed, we learn a little more about the couple's lives and careers which gives Aljaz a chance to show us what a great sense of humour he has, joking with the audience about how he grew up in Southend and how nice it is to return. What is abundantly clear to see is just how bloomin' nice they both are and how much fun they are having at this moment in their careers. They are full of praise for the Strictly team, of which they have been a part of for four years, after initially meeting each other in the musical Burn the Floor. The show features a fabulous supporting cast, who not only sing but dance and tap their way through some of the great numbers in the show including They Can’t Take That Away From Me, Night & Day, S’Wonderful, Cheek To Cheek, Puttin' On The Ritz, Let’s Face The Music & Dance, The Way You Look Tonight, Top Hat, White Tie & Tail. 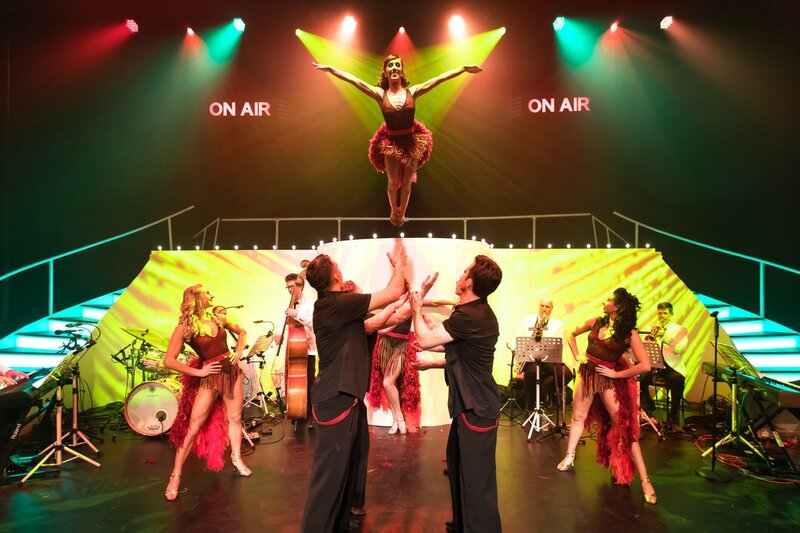 With David Page acting as host, he is joined by the exceptionally talented Alistair Crosswell, Scott Coldwell, Charlie Bruce, Veronica Fulton and Miranda Wilford who take turns to sing, tap and dance through their own numbers as well as accompanying Aljaz and Janette throughout the evening. Highlights for me included, Cheek to Cheek, Night and Day, A Fine Romance, The Continental and a fab drum and tap routine from Alistair Cresswell at the top of Act 2 which received a well deserved cheer from the audience. Remembering Fred celebrates the legacy of one of Hollywood’s true screen legends and entertainers and I'm sure that 'Moaning Minnie', as Fred Astaire's sister used to call him, would be full of praise for this wonderful homage to him and to the hard work and dedication that has been put into this production. Complete with some fabulous costumes, changes of which there are many, great songs and a sense of reminiscing for days gone by, this show really is a perfect opportunity for some romantic escapism. As Aljaz & Janette themselves state, "Fred Astaire is an inspiration to every dancer we know. And just like Fred, we will be doing it big, doing it right and doing it with style!" I couldn't put it better myself! The fifty-date tour began on Friday, 7th April, 2017, at Blackpool’s Opera House and will end on Saturday, 3rd June at Truro’s A Hall For Cornwall.